I met with my client, Paul, earlier this week. Because of the Thanksgiving holiday, it had been three weeks since our last meeting. I was looking forward to reviewing with him his list of Key Strategic Indicators that he’d committed to delivering – the critical, quantifiable reference points he’ll use to track the health of his business and his progress towards his stated goals. An hour before our call, nothing had been posted. Not a good sign. “You didn’t flake out, Paul. You procrastinated.” I waited for his response. Silence. Another long sigh. If you’ve ever complained that “I never seem to have enough time!” then you and Paul might be compatriots–conspiring against yourselves. If you consistently put off the critical things that you’ve promised–to yourself or others–you’d take care of, there’s something else going on here. Fact is, we all get the same amount of time every day. It's all about how we choose to use it. There are myriad reasons why we procrastinate; and there are often telltale signs that we are procrastinating even when we think we’re being truly productive. Do you keep busy doing low-priority tasks while the high-level creative or strategic work–the work that actually moves your business forward–remains undone? Are you checking and re-checking your emails without acting on them? Do certain items keep getting carried over on your To-Do list? Are you perpetually waiting for the “right time” to tackle certain tasks or projects? If you answered “yes” to any of these, you may be a practicing procrastinator. To admit that there’s a problem is the first step in addressing it. You’re afraid that you’ll fail. You feel unable or unwilling to make a decision. You’re overworked or too tired (and the added stress of the looming deadlines is disrupting your sleep!). You just don’t want to do it. You are too disorganized and distracted to effectively organize and budget the time. You don’t want to commit to starting a task unless you know it will be perfect. Deferring some tasks, especially low-level, unimportant tasks, is not necessarily procrastinating. Part of the art of self-management is being able to prioritize and, where possible, delegate. It might also be a good strategy to intentionally hold off on mission-critical tasks if you’re unable to focus due to fatigue – but that should be the exception – not the excuse. Deferring mission critical or simply unpleasant work does not make it go away – it just builds up in the background, lurking out there, adding to your stress and sense of overwhelm. It's a vicious cycle. As satisfying as it may seem to feel busy all the time, you’re probably not getting the results you want. For some people, the greatest hurdle is perfectionism. If it can’t be perfect, it can’t be done. Ok. I’m going to ask you to just stop that. It’s not going to happen. Nothing is perfect, and striving for perfection is just another way of putting things off indefinitely. Really – sometimes “good enough” is good enough. Leave room to improve and innovate – but give yourself something to start with. Plan your work and work your plan. Write it down. That first part is a popular cliche. I added the last part, because we know here at EMyth that there is extraordinary power in putting things on paper. There is an extra force introduced when you make your intentions visible. Developing effective countermeasures will not happen overnight. It’s a process, not an event. Confronting your own particular procrastination demons will not be comfortable or pleasant. But overcoming them is a gift that pays you back exponentially. Reclaim your time, your sanity, your peace of mind, and your life! The end of the year is the perfect time to commit to change. 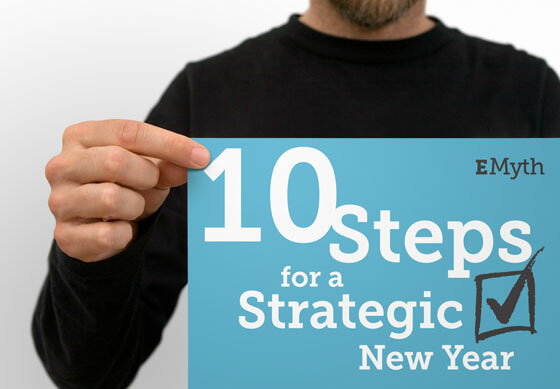 Let us help you get started with “10 Steps for a Strategic New Year.” Review the checklist. Write down your thoughts, intentions, and goals for getting your business organized. Commit to a fresh focus in 2018. As legendary football coach, Don Shula, once said: “The start is what stops most people.” Don’t let that happen. Contact us to set-up a free coaching session to help you start the new year with a fresh path forward. Adam is our Coaching Delivery Manager. He was a client of EMyth as a General Manager of a manufacturing company and was so blown away by the transformation that happened, he decided to become an EMyth Coach in 2002. He loves helping coaches and clients have more life.